Four-Legged Furballs: What's the deal, Mother Nature? What's the deal, Mother Nature? This past weekend, we had us some lovely autumn weather. There were open windows, lots of fresh air, and, after one or two rain showers, lots of lovely autumn sun. And now, two days later, we're back to nearly 90°F. It's hot and muggy, and the sun is more or less making us melt. My thoughts exactly, Thimble. Seriously, Mother Nature, what's the deal? Is anybuddy else at war with Mother Nature these days? 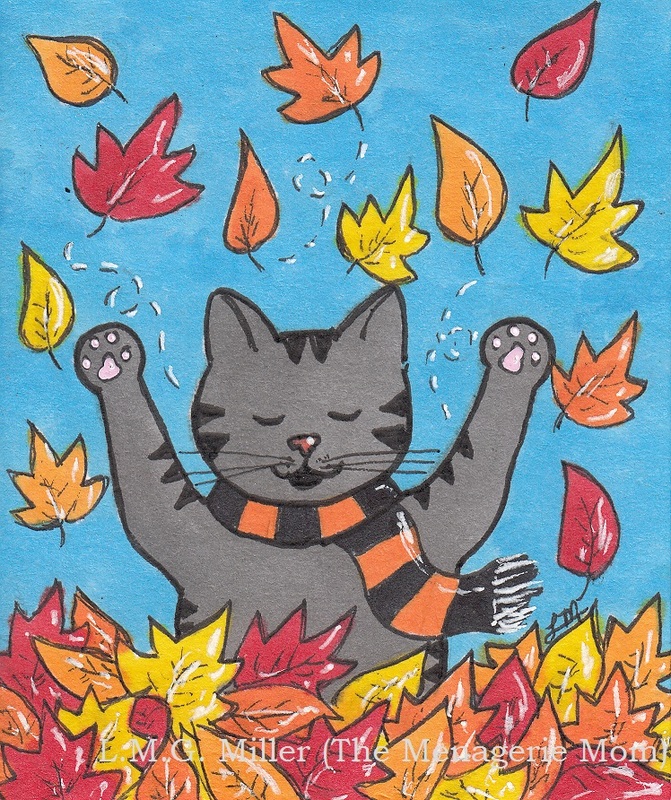 Well, even if it doesn't feel like autumn, we still hold out hope that one day it will arrive. Thimble is like her human of a mom and loves the cool weather. She loves the open windows, and the brisk air makes her extra playful. That's why I told her that she could star in today's drawing for JNW's Halloween Challenge, given that the prompt is fall/autumn. So, this one's for you, Thimble. Wishing all of our furiends a beautiful Tuesday! With cool air upon us, those with fireplaces might be considering lighting them up soon, if you haven't done so already. Today's tip is an obvious one, and it's to please practice fire safety around the fireplace, as well as around any candles and other open flames. For your furbaby's safety, please make use of a gate or another safe enclosure for the fireplace. Also please consider not initiating any playtime with your furbaby by the fire, not only prevent any accidents, but to also help them learn that the fire is not something to take lightly. And, of course, please consider only lighting up that lovely fireplace when you can monitor it and your furbaby. Even the most wise and responsible of furbabies can find themselves in trouble if left unattended in a risky situation. You and your furbaby can indeed stay warm and cozy by the fire, but please make sure this is done safely! We have been having really warm weather too but hopefully it isn't going to last. Great pictures of you Thimble. We also really like the picture today. Well done. We are having crazy weather up here, too. The weekend was gray and rainy and yesterday was almost 80 - though it was sunny so that's nice! We're having warm weather too...maybe not 90, but it will be about 80 today and honestly, we're not complaining...because it means we get our windows open! Window whiffies! It was very cold here this morning (hovering around freezing) but fortunately the sun has come out and it's really quite hot behind the glass in the conservatory. I LOVE your drawing, it is my favorite one so far, although I like them all. We actually were able to keep a window open last night so it is warm here again too, but not as bad as the summer. Thimble's photos are great, she is a cutie. I like the tip about a gate by the fireplace, I don't have a fireplace, but if I did, I would be very afraid of my cats getting into it. And the only candles around here are battery operated because I am a worrier. If that is not the cutest picture!! We're in the 70s today, but will be in the 90s tomorrow! Yikes! Mother Nature is not doing a very good job, and she should be fired. It's been a mild fall for us, but very rainy! Hope that isn't a sign of what winter will be like. Thank you for reminding people to have their fireplace and chimney cleaned - that is so important. It's turned warm here, too. Mom Paula hasn't lit our fireplace since we came to live with her 5 years ago. It is cold here and we have had frosty mornings for the past week. I am not complaining, I fear it is going to be a hard winter, so every day it is warm is a day I don't have to heat the house. Tell us about it...today we hit 81 and by the weekend it's supposed to be in the 40s! Have fun in the leaves, Thimble! Yeah, this IS a confoosing time of year. The temp goes up an down and down and up. 85 and humid in Chicago! We even had our a/c on! No. The past couple weeks, the temperature's been all over the place! Crazy! Our Astrid loves the cooler weather. She rarely goes on the catio when we have hot weather (which we did as well...two days ago the temp was 89 degrees). She'll spend the entire day out there on days like today: tamp is 64 degrees. We love that second photo. It would make a great meme of some type. XOCK, Lily Olivia, Mauricio, Misty May, Giulietta, Fiona, Astrid, Lisbeth and Calista Jo p.s. 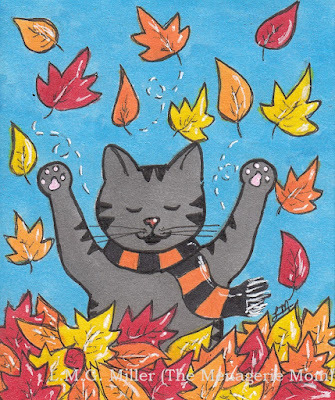 Today Mom has on her Kliban cat t-shirt where the cat is buried in a pile of fall leaves.